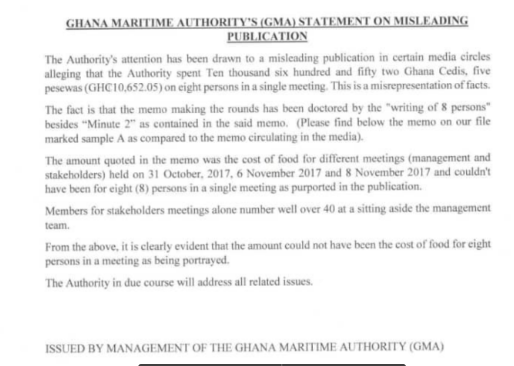 The Ghana Maritime Authority has refuted claims that it spent over ten thousand cedis on lunch for eight people in a single meeting. 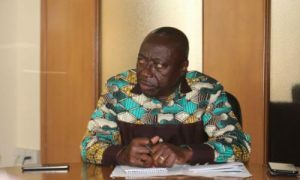 Some media reports had suggested that the Director General of the Authority, Kwame Owusu, authorized the payment of over ten thousand cedis for eight people for lunch, and a separate amount of over one hundred thousand cedis to Luxe Suites Hotel; a company he allegedly owns. Many have since criticized the Authority, questioning how over GHC 10,000 of taxpayer’s money could be spent on food for eight persons in a day. However, a statement issued by the management of the Maritime Authority stated that the document was doctored to give the impression that government actually spent the said amount in a day on just eight people. It indicated that the said amount was for the cost of food for management and stakeholders on three different occasions for over forty people. “The Authority’s attention has been drawn to a misleading publication in certain media circles alleging that the Authority spent Ten Thousand six hundred and fifty two Ghana cedis, five pesewas (GHC 10,652.05) on eight persons in a single meeting. This is a misrepresentation of facts. The fact is that the memo making the rounds has been doctored by the “writing of 8 persons” besides “Minute 2” as contained in the said memo. The Authority said it will address other related issues in due course. The post Ghana Maritime Authority denies spending GHC10K on lunch in single meeting appeared first on Citi Newsroom.